Posted March 16, 2015 by Amy Archer-Williams & filed under Episodes. ‘We’ve found our man,’ Sir Arthur Conan Doyle announces midway through the final episode of ITV’s three-part drama Arthur and George. When the main character says something like this with an impenetrable air of confidence whilst there are still twenty five minutes of a finale left, you know there’s a plot twist yet to come. And Arthur and George does not disappoint. This episode is fast-paced and full of plot, following the mystery of The Great Wyrley Outrages with an intense focus which makes this last episode possibly the most compelling of the three – which is fantastic, as it’s always frustrating when a finale can’t quite manage to wrap everything up sufficiently. But the juiciest plot twist comes when the likeable and (apparently) helpful Harry turns on Sir Arthur’s gang and is outed as the true villain. ‘Wouldn’t it be something to outwit the man who invented Sherlock Holmes?’ Harry sneers, as confessions of old resentments and simmering rages festered over years come to an explosive boiling point. It’s very well acted – the main cast have already been praised in previous reviews, but it’s only fair to mention Ciaran Owens here too, as he is excellent as friend-turned-foe Harry. From the first episode, Arthur and George showed an impressive talent for unnerving the audience by emphasising that ‘something is going to jump out’ feeling, and this episode has plenty of that – there is enough suspense to possibly require a cushion to hide behind. The various threads of plot are neatly wrapped up, including George’s future as a solicitor and the question of Arthur’s relationship with Jean Leckie. All in all, this is a finale which really delivers on the potential of the previous episodes – and it does so with a flourish. Well done, ITV. Aired at 9pm on Monday 16 March 2015 on ITV. Really liked this and a great show for a Monday night. Infinitely better than the horrible Boredchurch which it replaced. More like this please, ITV. Amy, Thank you for the nice review. As you mentioned, writer Julian Barnes concluded the story line nicely and efficiently. In real life, other than Georges’ pardon, I don’t think the police or Conan Doyle conclusively found the guilty parties. Helles, I agree 100%. A & G was very entertaining through out all 3 episodes. I think it was just the right length–3 episodes. Broadchurch was below average and should not have been renewed for season 3–why bother? Boredchurch was only renewed for the money and because ITV can be so lazy sometimes in commissioning new shows. The second series was a complete failure on every level – truly wretched writing, dreadful hammy acting (apart from Olivia Colman), far too long, badly paced, ridiculous plot lines and terrible ratings. ITV really should have stopped Chibnall et al at the first series which was fine but overrated. Sadly, money and egos seems to speak louder than common sense and presumably the third series will continue to be an embarrassment but ITV are desperate for lightning to strike again and must hope that everyone will have forgotten how vile series two was by the time it gets around to being shown. 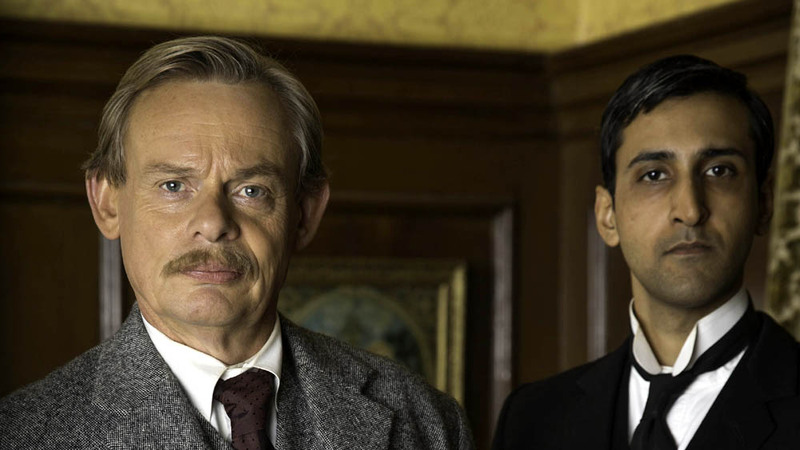 Arthur and George and Mr Selfridge are the sorts of shows ITV should be investing in. Good solid entertainment without the pretention to high art or flash bang. Better to get the money spent on scripts and good production rather than so-called ‘stars’. ITV do have a couple of potentially good shows coming up, including one with the very reliable John Simm which looks to be even better than Prey, another good solid show. These also have the advantage of not outstaying their welcome for the sake of wringing out more sponsorship dollars. And give me Martin Clunes any day over David Tennant – much less flashy actor but he brings a quiet dignity, lack of ego and understanding to his roles which make him so much more watchable. I wanted to like this, i have been a life long Doyle fan and I was looking forward to it but I was left slightly disappointed. Clunes and the rest of the cast were excellent. It was interesting, tense and dramatic then seemed to wane and loose my interest in places each episode, possibly if it had just been a two parter rather than three then I may have enjoyed it more. Or even presented as a 2 hour TV movie.